mPods (also known as custom sleeves) don’t just improve the comfort and security of the fitting but also help to provide unbelievable sound isolation. You’ll be aware of the nuances in your music that you won’t have heard before, even in noisy environments. Quite simply a must have for any commuter! 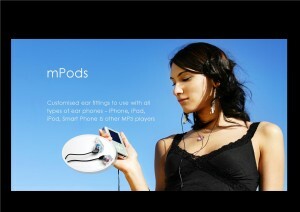 More and more people are moving to mPod fittings for listening to their music. As they are tailor made for your ear, you will get perfect comfort every time. No more aching, no more fatigue, no more discomfort. mPods really reduce noise levels around you, which means you can be more “at one” with your music. Also, because they fit deeper into the ear they will allow you to reduce volume levels and produce a higher quality listening experience. If you are listening to music in background noise, like traffic or a commuter journey, you will recognise what a bonus mPods will be! Simply contact us for a 15 minute appointment. We will take a silicone moulding of your ear to create your personalised, custom fitting. Remember that we will need to know the headphones you are using or if you are not sure of the model, bring them with you when you come to see us. 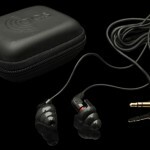 Did you know you can turn your ‘mPod’ custom ear plugs into In-Ear Monitors? T15’s are one of the most versatile in-ear monitors available on the market today offering both generic and custom fit options whilst delivering an uncompromised sound quality. 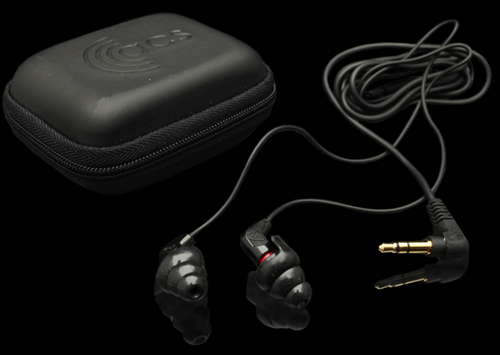 If you’re a user of either ER series or PRO series custom-fit earplugs, you can also use the T15 as a custom-fit monitor by simply removing the filters from your earplugs and pressing the T15 in their place, giving you instant custom-fit monitors. This also means that you can easily upgrade your T15 to custom-fit with a set of ER or PRO series custom moulds. Great for performers who are just starting to use in ear monitoring technologies as well as audiophiles wanting high quality levels of sound whilst listening to laptops, iPods or MP3 players of any make!